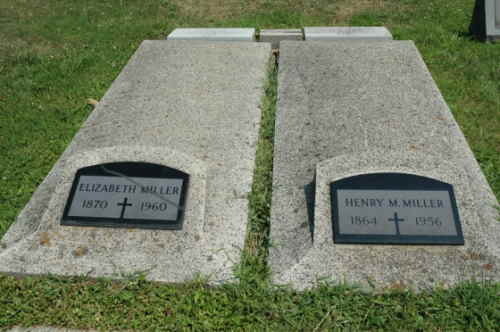 The fourth son of Lawrence and Christina Miller, Henry Miller was born on the 23rd day of September in 1864. The family was living in their two story farm house which was built from wood that came from one poplar tree. It was located on the east side of the road, just about a mile south of the main road going into Holton. 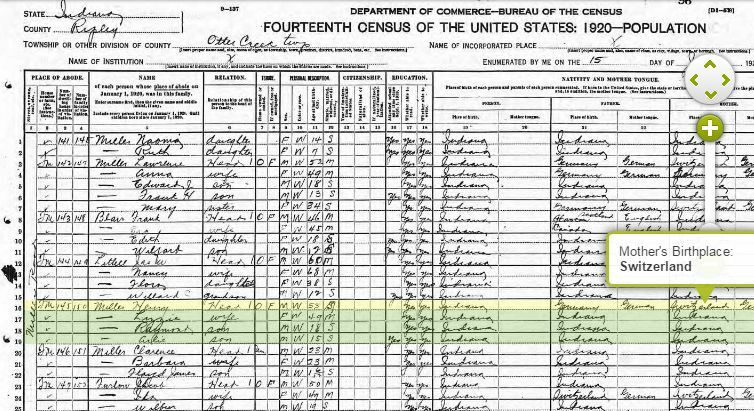 According to the 1940 Federal Census, we know Henry attended through the 6th grade for School. 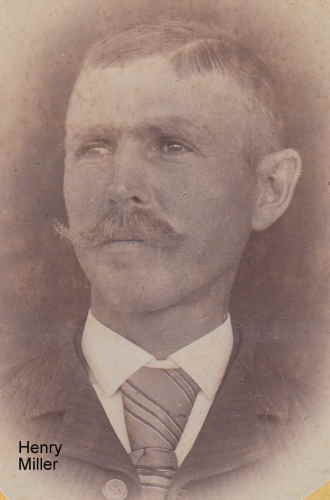 It appears that he might have attended the one-room schoolhouse that sat across the road from the family home. One might even wonder if his father had a hand in building the schoolhouse since it’s close proximity to their farm. The Miller family attended church services at the Saint Magdalene Catholic Church in the community of St Magdalene, which was about 5 miles southwest of their home. This is where we might presume he met his future wife, Elizabeth Meisberger. 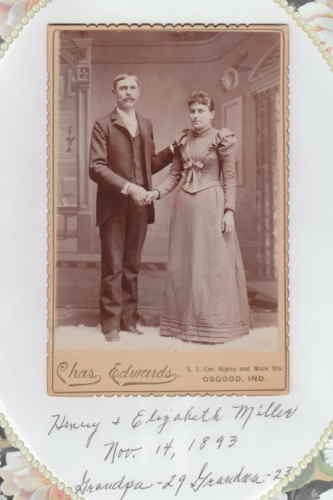 Henry was 29 and Elizabeth 23 at the time of their marriage in the church on the 11th day of November 1893. 1895 Henry and Elizabeth Miller home on the Miller Road. By the time of the building of their home in 1895, Henry owned 160 acres of choice farmland located on what was known as “Miller Road” because of the multiple Miller’s on that stretch. Henry crafted stone pillars at the foot of his drive leading up to the house. The stone pillars still stand today and one of them has a date we believe is Sept 5 1915 etched into the top of it. 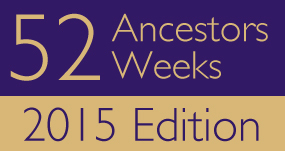 We have a photo of this and it will be added at a later date. Mark has a piece of very old barbed wire that possibly Henry placed on the pillar. 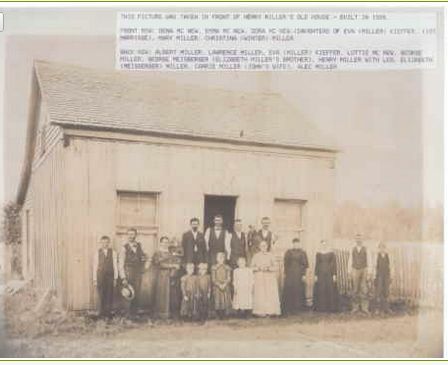 Children came along with Leo being first and in the photo of the home that the family built in 1895 (above and to the right), Clarence followed in 1896, Raymond in 1901 and Arlie in 1904. Henry and Elizabeth lived on this farm until sometime between the 1930 Census and 1935 when the house burned down and they bought a home in Holton where they spent the rest of their lives. 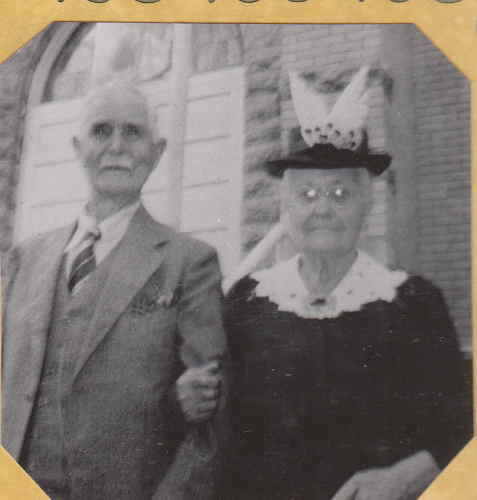 Henry and Lizzie celebrated their 50th wedding anniversary in 1943 with a nice party that many family members attended at St. Joseph’s Catholic Church in Osgood where they attended Mass after St. Magdalene closed down in 1941 due to the Jefferson Proving Ground. 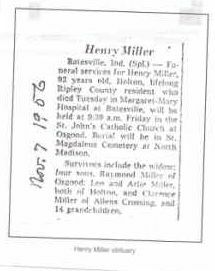 Henry passed away in Batesville, while in the hospital, on the 6th of November 1956 at the age of 92 from Chronic Cardiorenal Failure according to his death certificate. He was buried in the St. Magdalene Cemetery (next to the St. Patrick’s Catholic Cemetery) in North Madison, Jefferson, Indiana. This is where they moved his long time church’s cemetery after World War II took over the area for the Jefferson Proving Ground.